Ahhhh, May! That favourite time of year when we really begin preparing our outdoor living areas in anticipation of the barbecues, games and luxurious lounging that is sure to follow in the coming summer months. Having been around for 40 years with over 125 million square feet of vinyl decking installed throughout North America, Duradek wants to be sure that your deck is still the best it can be. While the obvious task of cleaning any organic debris, dirt and soil from the deck or patio surface is usually the first step for many home owners, be sure to include the critical step of a complete deck inspection. Paying particular attention to the waterproofing details on and around your deck such as the caulking around posts and drains can help you isolate any vulnerabilities in your deck before weakening can occur or unfortunate accidents can take place. The North America Deck & Railing Association (NADRA) is the decking industry’s most visible association, and they have a very strong consumer focus. Deck safety is a critical issue to NADRA, and the organization has a mandate of increasing public awareness of the necessity of regular inspections and maintenance of existing decks, and proper installation of new decks. 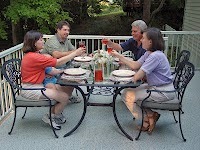 This initiative prompted NADRA to declare May as Deck Safety Month ® in 2006. NADRA estimates that there are 40 million decks in the U.S. that are over 20 years old, which means they were installed prior to today’s building codes. This makes deck safety a critical issue that must be addressed and NADRAhelps to make it easy by providing a Deck Safety Consumer Checklist and a Deck Safety Evaluation Form for builders. This is a fantastic free tool for keeping all your deck renovation assessment details together and can be very handy to reference when getting estimates or discussing project options. You can get both of these very handy free tools on the NADRA website. Deck collapses happen far too frequently and when they do happen, they happen fast. For example, the Christmas Party in Indiana in December 2013 where a group photo on the deck was interrupted as the deck gave way with no warning, sending two dozen family members crashing to the ground. The family released security footage of the collapse and it is startling to see how sudden and unexpected the collapse was. See the footage of the deck collapse on YouTube. More recently, in April 2014 another family photo resulted in five out of sixteen family members suffering injuries when they fell 10 feet to the ground when the deck collapsed on a deck at a restaurant in Ontario. This wooden deck appears to have been left unprotected from the elements and seems to be yet another unfortunate example of a deck weakened by water infiltration to the point of structural insecurity. Duradek is proud to be a member of NADRA and takes deck safety very serious too. Whether you are located in Canada or the United States, ensuring your deck meets building requirements is critical which is one of the many reasons it makes sense to have your deck build by a decking professional. Right from the initial construction of the deck to the condition of the substrate, the application of the waterproofing and the installation of the railings, each stage requires its own detailed expertise and is a major factor for Duradek recommending that you do not do the job yourself. If you are considering renovating your balcony or deck to ensure your family photos are all taken safely, one of our Duradek trained waterproofing specialists would be happy to provide you with a free estimate on your decking project.